Intrigued with the word “prefabricated”? Yes, this house is indeed prefab. 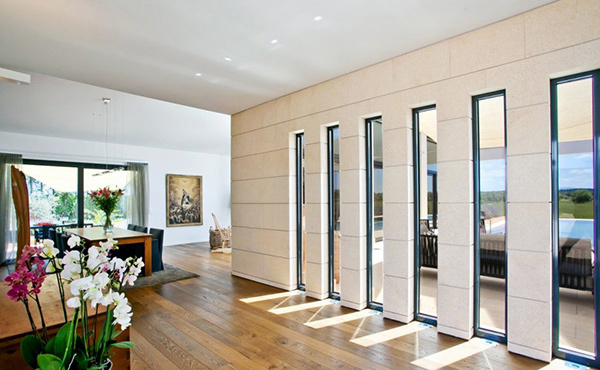 Our house feature for today is a prefabricated passive house built in Germany and shipped to Mallorca. Amazingly, this is what technology can already do today. 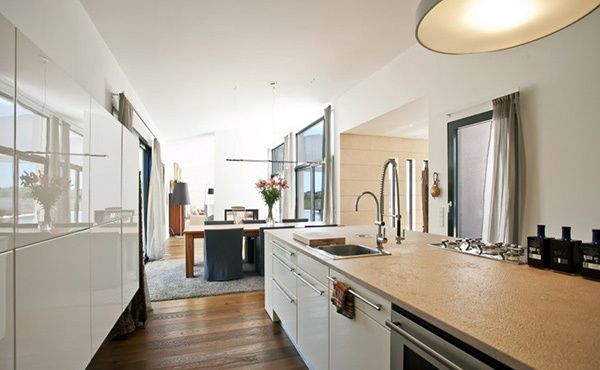 High quality materials were used in building this house on a 17,000 sq. m. plot. 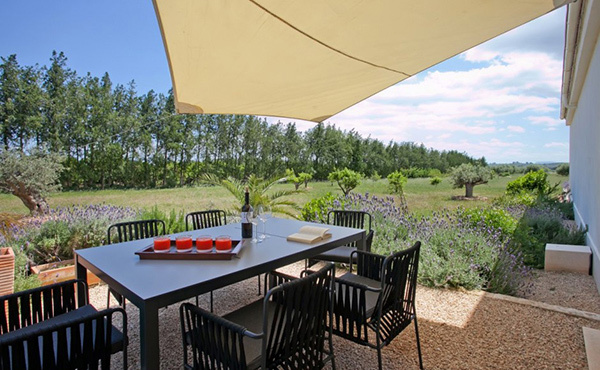 This designer country house is seated on an area filled with silence and serenity making it a perfect home for those who want to relax and unwind. 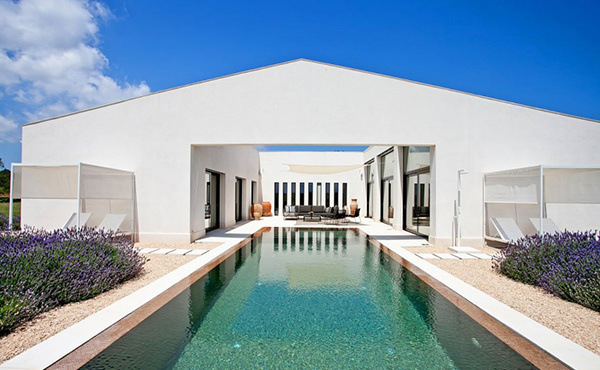 This villa is built with an H-shaped design on one level. 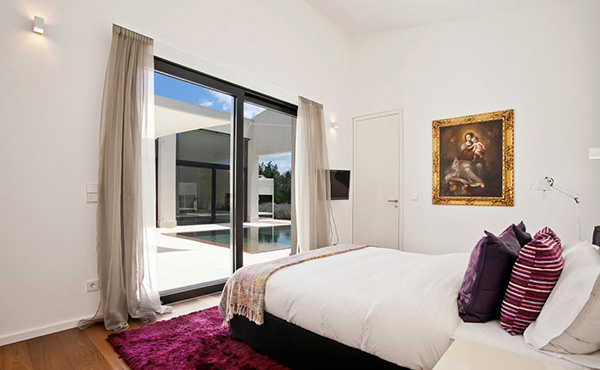 The house has large windows providing a view of the courtyard and the pool. It has a spacious living space with entrance hall, piano, modern kitchen, 3 bathrooms, 4 bedrooms, a master bedroom with dressing room, bathroom en suite, spa with sauna, Jacuzzi and shower, office room, guest WC and utility room. The dining room is separated from the living room with a lovely fireplace. The design is both simple and elegant. Want to know what we are talking about? Check out the pictures below. From this view, you can see the H-shape with a lovely courtyard at the end. 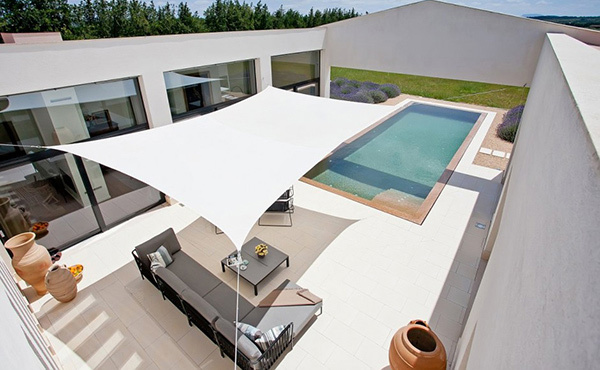 A bird’s eye view of the courtyard with fabric canopy located just near the pool. This area is indeed perfect for relaxation. A part of the house that can be good for horses and even for plants. 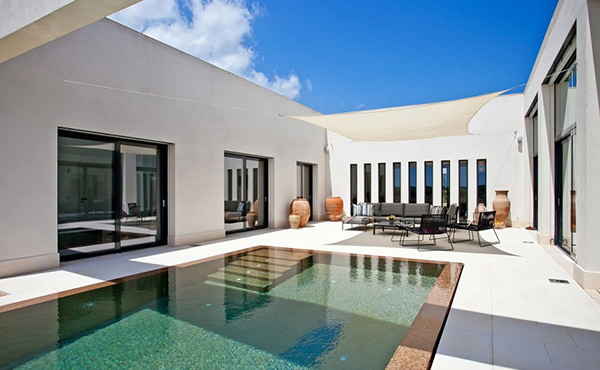 The pool makes this villa look more inviting. It is a simple rectangular shaped pool but it sure is refreshing. The designer did well in decorating this courtyard using jars of different designs and sizes. 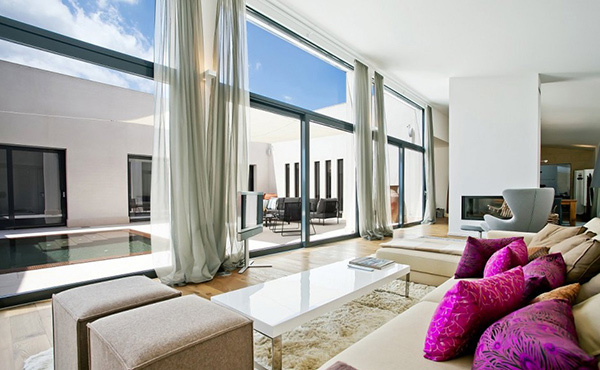 The large glass windows could provide an airy aura to the living room. The purple pillows on the sofa are perfect accents to this area which uses natural color palette. 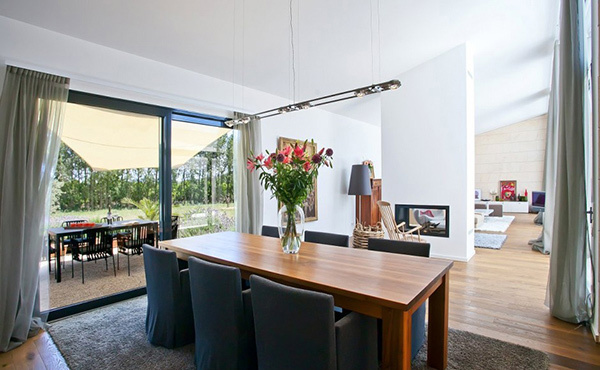 The dining area with wooden table and gray chairs is separated from the living area with an elegant modern fireplace. You can see here one side of the interior which has a creative wall design of concrete and framed glass windows. 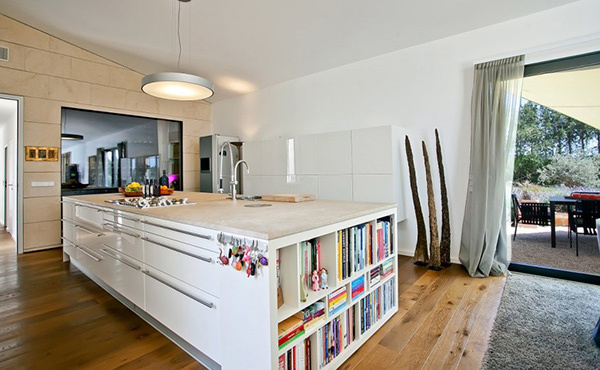 The white kitchen island has storage spaces not just for kitchen items but even for books. Using white for the kitchen made it look neater. High technology equipment was used here. Remember the purple throw pillows in the living room? Same accent color is used for this bedroom. Another bedroom that uses gray and green combinations for its fabric in chevron style. As you can see, it has a minimalist design. A dressing room wherein all their clothes, shoes and other belongings are organized in drawers, cabinets and boxes. 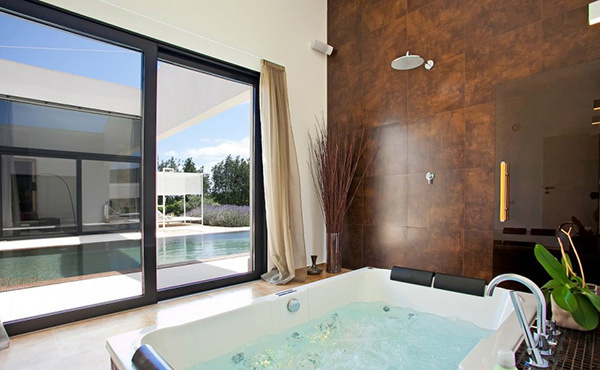 A Jacuzzi is a perfect spot to relax. Aside from what it can offer, this space is also well-designed with natural hues in it. 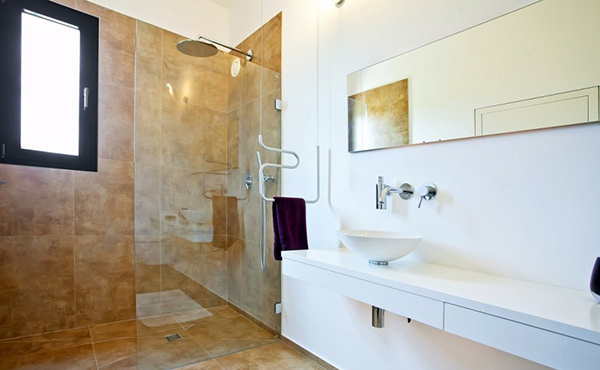 A luxurious modern bathroom with gold accessories will surely make you feel the real meaning of “comfort”. 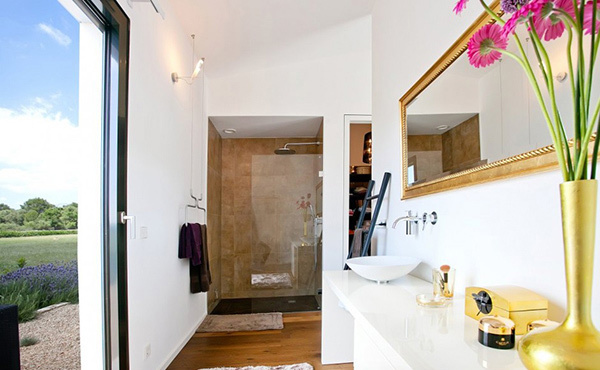 The glass shower area and the white vanity are seen in this image. Colors matched well from the ceramic tiles to the white finish of the vanity. One can always spend time outdoors in this area. This is another outdoor option aside from the courtyard. 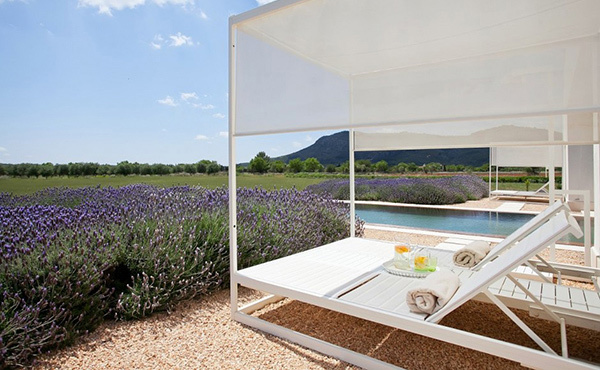 On the sides of the pool, there are white wooden lounge day beds – a perfect spot unwind! 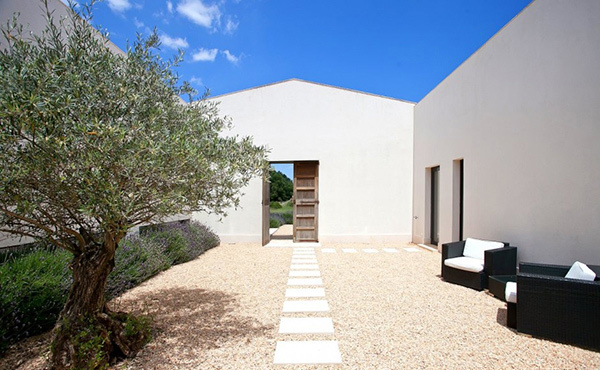 The house uses high quality facilities including Parquet flooring with under floor heating. 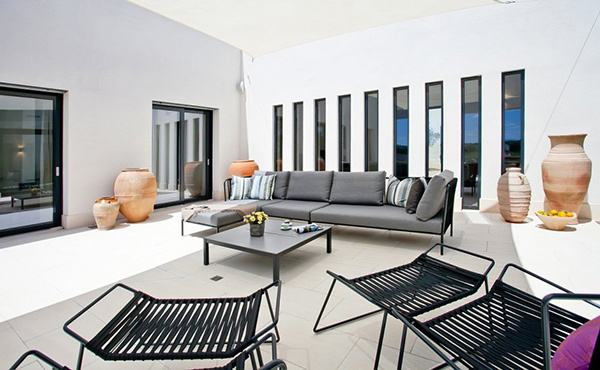 It has insulated exterior walls, aluminum double glazed windows and sliding elements. 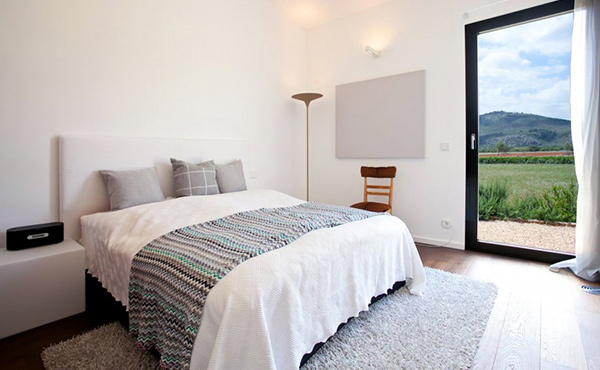 Another good feature of the house is its home ventilation and heat pump that would make them feel comfortable both during the summer and winter. There is also a private well that could produce 80,000 liters of water in a day. Aside from that, there is a portion of the lot allocated for agriculture and for horse lovers. EcoDESIGNfinca was able to create a lovely house design that would make this house perfect as a getaway home from the urban world.